The Ridgewood Guild is proud to present the 5th Annual International Film Festival Wednesday, April 29, Thursday, April 30 (at the Bow Tie Cinema, Ridgewood), and Friday, May 1 (at the Ridgewood Public Library). “There were so many high caliber entries from around the world this year, the Executive Committee felt the time had come to expand the festival from two nights to three, “ stated Film Festival Chairwoman Lynne Clements. Red carpet festivities will begin at 6pm each night, with film programming running in two theaters simultaneously, beginning at approximately 7pm. Ridgewood Mayor Paul Aronsohn will be on hand to open the festivities on Wednesday, April 29. Attendees will be treated to short subjects, experimental films, documentaries, music videos, as well as feature length films. With celebrity guests and film screenings complemented by lively and informative Q&A sessions with cast members and filmmakers, the annual Ridgewood Guild International Film Festival is highly anticipated by independent filmmakers, professionals, film lovers and enthusiasts as well as students who participate in our 'Student Filmmaker Night' (Wednesday, April 29). “We celebrate excellence in US and international independent films of all genres; now that we’ve been here for five years, the filmmakers are reaching out to us in greater numbers with even better films….how wonderful for Ridgewood and for the viewing pleasure of our attendees! “ said Ridgewood Guild Board President, Tony Damiano. Wednesday, April 29: We are proud to present Oradell native Jon Milano’s short film “Straw Dolls: A Film About the Armenian Genocide.” This touching tribute, which will be screened on the 100th anniversary of the genocide, took two years to research, and is based on true stories uncovered in journals, photographs, survivor interviews, and academic books. In addition, author Douglas Kalajian (Stories My Father Never Finished Telling) who was involved in the filmmaking, helped the team uncover even more rare stories to tell. Very few creative liberties were taken with this film, for all involved knew that it had to be rooted in truth. Starring award-winning Iranian-Armenian actress Mary Apick, Marco Khan(ian) and an ensemble of young Armenian actors. Wednesday, April 29: Student films will be shown. The Annual Student Filmmaker Scholarship will be announced on Thursday evening at the After Party & Awards Ceremony at Park West Tavern. Thursday, April 29, 4:30-6pm: “Film Makers Lounge” Park West Tavern, 30 Oak Street, Ridgewood, NJ. Come and enjoy a special food and drink menu for filmmakers and filmgoers before attending the red carpet event and film festival. Thursday, April 30, 10:45pm: “Film Festival After Party and Awards Ceremony” Park West Tavern, 30 Oak Street, Ridgewood, NJ. 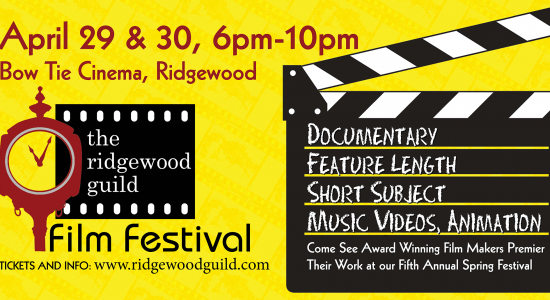 Join us and mingle with the filmmakers, actors, festival goers, and Ridgewood Guild Members while enjoying complimentary bites as we announce the winners of the 2015 Ridgewood Guild International Film Festival. Friday, May 1, 7-11pm: An evening of Foreign Films at the Ridgewood Public Library. “We are so pleased to be able to share the wealth of high quality films submitted this year with an already established foreign film loving audience through partnership with the Ridgewood Library,” shared Dotti Fucito, Ridgewood Guild Film Festival Board Member. Tickets can be purchased at Mango Jam: 41N. Broad; or on line at:http://www.brownpapertickets.com/event/1443479, or at the door.